One of the most sought after tourist destinations of Asia, Kerala has been showered with unique geographical features by nature. 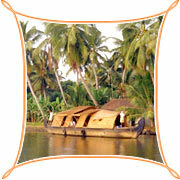 Kerala boasts of the most spellbinding travel destinations, which are within an hour's drive from each other. With the Arabian Sea on the west, the Western Ghats towering to an altitude of 700 metres above sea level and a network of forty four rivers, Kerala is a must on every tourist's itinerary. Palm-fringed beaches, tranquil stretches of backwaters, lofty peaks, gurgling waterfalls and exotic wildlife make Kerala truly the 'God's Own Country'. Sandwiched between the Lakshwadeep Sea and the Western Ghats, Kerala is a bustling little green-and-silver, coconuts-and-water state on the west coast of India. It is bounded by Karnataka to the north, Tamil Nadu to the east, and the Arabian Sea to the west. Thiruvananthapuram is its capital. Every district in Kerala has it's own unique culture and characteristics. Thiruvananthapuram is known for it's beach- Kovalam, the Sri Padmanabhaswamy Temple and various museums and palaces; Alappuzha for it's backwaters, Thrissur, the cultural capital, Kottayam for it's ancient churches, Kozhikode for it's old world charm and the entrancing Ponmudi or Golden valley. Though a bit of a tongue-twister, Thiruvananthapuram - the present official name, is closer to it's mythological origins. The word ' Thiru ananthapuram' means the city of Anantha or the abode of the sacred thousand-headed serpent Anantha, who forms the couch on which reclines Lord Vishnu, the preserver in the Hindu trinity. Built on seven hills, it was the capital of the Venad chieftains. The city has grown as a tourist and commercial centre, with the International airport becoming the main gateway into Kerala. Being the state capital, it also throbs with political activity. Athirapilly Waterfalls : Athirappalli and Vazhachal, the two scenic and popular waterfalls on the edge of the Sholayar forest ranges are just 5 km apart. The falls are very popular with tourists. Athirappally is located 78 kms from Kochi, located at the entrance to Sholayar ranges, this waterfall is a popular picnic spot. Affording to the onlookers, one of the most bewitching sights, Athirappally Falls is about 80ft. high and located in the forest area. Combined with the greenery, it infuses freshness into any tired soul. The Athirapally Falls join the Chalakkudy River after plummeting a drop of 80 feet. Kovalam Beach : On the Malabar coast along the Kerala shore line is a small village, called Kovalam. This sleepy town suddenly came on the tourist map when its fabulous beaches were discovered. Today Kovalam has become one of the most popular beach hangouts in India. 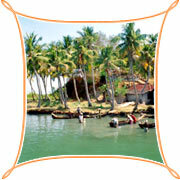 Kovalam means a grove of coconut trees and truly the coconut trees along the beaches gives it a ravishing look. The palm-fringed bays in secluded coconut groves, promise a relaxed stay. The boundless blue waters of the Arabian Sea and miles of white sands washed away by the surf at the feet of the stalwart palms and the rocky promontories, makes this beach paradise. This marvellous beach is a tourist's dream come true. Kappad Beach : Kappad, the historic beach. It is the beach where Vasco da Gama landed on the 27th of May, 1498 with 170 men in three vessels, thus discovering a sea route to India. The rock studded beach is locally known as Kappakadavu. An interesting feature of the landscape is the sprawling rock that protrudes into the sea. The temple on the rock is believed to be 800 years old. A solitary pillar commemorates the event with the inscription, "Vasco da Gama landed here, Kappakadavu, in the year 1498". The sea here is placid and seemingly untouched by history or time. Edakkal Caves : Situated on Ambukuthi Hills, Edakkal caves are 10 kilometers from Sultanbathery, in Wayanad district. Formed by a large split in a huge rock, the two natural rock formations represent the world's richest pictographic gallery of its kind. The two caves located at a height of 1000m on Ambukutty Mala near Ambalavayal can be accessed only by a 1 km trek trail from Edakkal. Edakkal literally means 'a stone in between'. It is a prehistoric rock shelter formed naturally out of a strange disposition of three huge boulders making one to rest on the other two, with its bottom jutting out in between and serving as the roof. Edakkal rock engravings stand out distinct among the magnitude of prehistoric visual archives of paintings and graphic signs all over the world. 10-day annual festival in January at Sreekandeswaram Temple, Thiruvananthapuram. In February, is the week-long Nishagandhi Dance festival; Pooram festival in Thrissur around April-May; Flavor Food Festival, at the Kanakakunnu Palace grounds, Thiruvananthapuram in May. Onam Week celebrations, the annual harvest festival of Kerala begins in August and lasts for 10 days. Another important festival is the annual Pongala Utsavam, to which only women are allowed at the Attukal Bhagavathy Temple, Thiruvananthapuram. Therayattam festival is held to propitiate the gods and demons recognized by the pantheon of the Malayalis. The climate is equable and varies little from season to season. The temperature normally ranges between 27º and 32º C in the plains but drops to about 21º C in the highlands. One aspect of the state's rich cultural heritage is manifest in its varieties of religious architecture: ancient Hindu temples with copper-clad roofs, later Islamic mosques with "Malabar gables," and colonial Portuguese Baroque churches. Splendid paintings, especially murals, exhibit distinct local traditions and styles. The land is a flourishing center of the Kathakali dance form. The state has also a rich theatre tradition: the only surviving Sanskrit drama, Koottiyattam, is still performed by the Chakkiars of Kerala. Some principles of the Natya-Shastra are evident in their presentations.